This apartment is located just outside the city of Lagos, 1km from the centre. The 110m² accommodation is located on the first floor and contains a living room with sofa bed, kitchen diner, two bedrooms and two bathrooms. 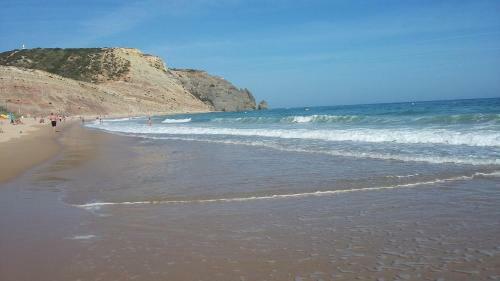 Located 300 metres from Luz Beach in Luz, this holiday home features free WiFi and a terrace. Guests benefit from balcony and a sun terrace. Free private parking is available on site. With a small pond with water lilies, the Holliday Villa Boavista Lagos is a 4-bedroom villa offering an outdoor pool and a landscaped garden. It features a quiet location in Lagos, within the Quinta da Boavista complex. Located in Lagos, Casa Marques offers self-catering accommodation with free WiFi. The unit is 800 metres from Meia Praia Beach Lagos. Free private parking is available on site. The kitchen is fitted with a dishwasher and an oven.